Here we enter the mad world of the Visoflex! I'm currently using a Visoflex II with my old 90mm F4 LTM Elmar and 135/4.5 M Hektor. If you missed the introduction about the Visoflex and are wondering what i'm actually on about, the Visoflex was a device made by Leica, to enable you to turn your rangefinder into an SLR via a series of adapters, your existing lenses and a mirror housing: or Visoflex unit. I'm going to give a little information on the original Visoflex, but the bulk of the information will be placed on the practicality of using the Visoflexes for the M. I hope i'll add more to subsequent pages as time goes by (I haven't even started looking at the use of the Visoflex with bellows), but i hope after reading this that you won't be afraid of getting involved with this system should you choose to; and i hope there is sufficient information on one page to get you started. If you are using an M5 or M6TTL and wish to use a Visoflex, please read on and be sure to head over the page.The other thing you may want to check out is Jay's Hexarflex. Yes that's right, the Visoflex on a Konica Hexar. It might be worth keeping in mind that there were other manufacturers of reflex housings for the Leica. These come in all sorts of variations. From what i've been able to find out thus far, the most popular of these was probably the Kilfitt reflex housing, which was apparently well made and also possibly had its own adapters. Accura made one [see Illustration] as did Komura with a reflex housing called the Telemore. The Telemore used a 48mm mount compared to the Visoflexes 50mm, which suggests you would have to use the Komura produced adapters with it. This is something else to have in mind if you want to use another company's reflex housing. You may be dependent on finding proprietary adapters to be able to use your housing correctly, if at all. One of the many wonderful things about Leica is the longevity of their products. Most of the adapters that Leica made are still available used today. early Visoflexes. Thanks for the image, Mike! In addition to the different reflex housings, you could also use a variety of different manufacturers lenses. There are a number of guides available about these lenses in Leica Thread Mount (LTM), but an excellent primer can be found courtesy of Marc James Small's 'Non-Leitz LEICA Thread-Mount Lenses - A 39mm Diversity' One example of these lenses is the Tele-Picon. My thanks to Greg Benson for this image. Produced by Paul Piesker, the Tele-Picon was manufactured by a Berlin-based company during the 1950's and 60's who mainly specialised in medium and long long-focus lenses. In the 1960's they "were not poorly regarded". Here endeth the sermon on the Tele-Picon. Designed predominantly for 90mm lenses and longer, the Visoflex may help you in numerous ways. It is also a great way to make macro shots with your 35 and 50mm lenses. In many respects the Visoflex has almost become unfashionable, and almost impolite to mention in some circles, but like anything esoteric, it does have its adherents. The fact is--It works dammit! I hope this page doesn't come across as patronizing, but without illustrations it is more difficult, and Leica's code words are frequently more esoteric than a Masonic lodge! 1. 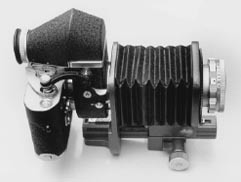 The original Visoflex was called a PLOOT , as it was Leica coded, and was for screw mount or Leica Thread Mount models. It was somewhat larger than the II, IIA and III Viso's and comprised of a mirror reflex housing that was factory bundled with two magnifiers and a double cable release unit. It went through a number of changes between 1938 and 1943 and then to 1951, where there is some expansion and differentiation's until becoming the Visoflex I in 1951. 1951 appears to be some kind of watershed for the Visoflex I, partially due to an expansion of magnifiers: These come under a different series of code words, such as PAMOO, a 5x right angle magnifier, and a PEGOO 45 degree magnifier that presented the image laterally correct. Previously, the PLOOT had had a similar functionality with the PROON, which was the basic PLOOT that came with 5x and 30x magnifiers. There was also the POOIM and ODULO. These codes were descriptive of the magnifiers that the PLOOT came with. For example, the ODULO came with 5x, 30x [and later] the PAMOO  viewfinder for 5x right angle focusing. As good as the PLOOT and Visoflex I idea from Leitz was, it was limited in its usage by only allowing focusing to infinity with lenses from 125mm or longer. Although rare, there is a version of this Visoflex for the M, but because of the focal length limitations it is limited in its usage; meaning i'd recommend getting a later one. 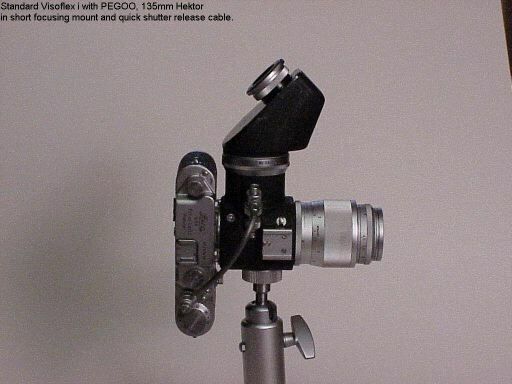 Visoflex I with 135 Hektor in short focus mount with PEGOO. My thanks to Rob Deane for this image. This is the Visoflex II, OTXBO magnifier, with Bellows II on an M3. to Roy Moss for permission to use this image. Some folks wonder why some folks complain about consumer choices these days! The Visoflex II dispensed with the double cable releases, and uses a lever on the side to lower the mirror. You can use a standard cable release on the Visoflex II, but the main advantage with the II over the I, is that it is easily used hand held. After each shot you have to move the lever to a downward position relocking the mirror for your next shot. Sound like an annoying process? Not really, depending on what sort of photography you're doing. This was later modified with an auto return system in the intermediate IIA and then further developed for the Visoflex III. But spending time DOING photography is why i started using a Leica to begin with, and the Visoflex III is a lot less streamlined and more expensive. Why not the IIA? It is rare and therefore usually far more expensive. If you have a choice? I'd far recommend the IIA as opposed to the III for most applications. Having said that, Matheson says you can't use the II or IIA Visoflex with an M5, so most definitely go with the III in that case, O.K ? 4. Attach OUAGO adapter to Visoflex II housing. This takes all of 2 minutes from start to shoot. Now, the Visoflex release arm i mentioned is an adjustable arm with screw that swings forward and backward. In the forward position it leaves the camera unobstructed, but also leaves the Visoflex unsynched from your Leica's shutter. In the back position the small adjustable screw sits above the shutter release button. The arm controls the flipping of the mirror, therefore depending on the space between the screw and the shutter button, there will be either a short amount of time before the mirror flips up and the shutter clicks, or a longer amount of time before the mirror flips and the shutter clicks. If you're using a tripod you can have a kind of Mirror Lock Up (MLU) by increasing the space between the screw and shutter button, or alternatively leaving the release arm in a forward position and then pulling it slightly upwards triggering the mirror, then manually releasing the shutter. The first time you attach the magnifier you will probably have to adjust it for your eye sight. Looking through the magnifier there should be a small black circle in the middle of the screen. If the screen is black, then you haven't lowered the mirror! Turning the small chrome ring in front of the rubber eye piece you should be able to focus the eye piece until the circle is sharp. When done, you're ready to shoot! This was the trickiest part of learning the Visoflex system and the main reason for this page's existence. There are a great many adapters around for the Visoflex, most of them being produced in 1960, and they are usually designated via a 5 digit numerical or 5 letter code. As i mentioned, sadly, they usually don't list both. I've tried to confine the number of adapters listed here to those that are used directly between lens and Visoflex. There are a whole other series of adapters for using lenses, Visoflex and bellows for macro/reproduction work. If you're interested in doing that, you're going to have to do some further reading. In fact, you should do some further reading anyway. I'd recommend Andrew Matheson's 'The Leica and Leicaflex way'. Usually there are two different types of adapter: One for attaching the lens head to the Visoflex, and a second adapter to increase the focusing length. My 90mm LTM Elmar is an o.k. example. I hope it makes sense. 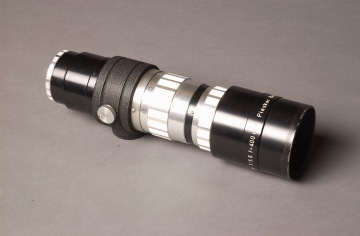 Used with the 90 Elmar head, the 16467/OUAGO is a helical focusing mount. It can't be used with the collapsible version of the Elmar; and focuses from infinity to 3 1/4 feet. If you want to extend the range you can use the adapter below. Two x 16468/OTQNO = a little under 20 inches. 16453/ZOOEP Short mount to use 90 Summicron head on Viso II directly, with scale. Intended for the pre-set lens head. 16495/ZOOAN Short focusing mount for Hektor 135/4.5 lens head, used in combination with the OUBIO. 16469/OUFRO [OTSRO/16472 is similar, specifically for the Hektor and Elmar 135] Can be used for all lenses at close range. Note: I'd recommend the OUFRO, it's a lot more functional, but how much do you want to invest in this system? 35 and 50 lenses can be used on the Visoflex II and III at extraordinarily close macro range, but you won't be able to focus on anything beyond a couple of inches. Notice how frequently an adapter seems to be designed for the 135 focal length? Please, don't stress about it and get discouraged. I currently use the 16495/ZOOAN and the 16466/OUBIO with my 135/4.5 Hektor's disembodied head- with just 2 adapters and the Visoflex II, you're off to a good start. As an aside, I recently went through some confusion with the numeric listing for the OTXBO, which John Collier brought to my attention. After doing some digging, and asking Marc Small if he knew anything about the conundrum, I found that there are three different numerical codes for the OTXBO. 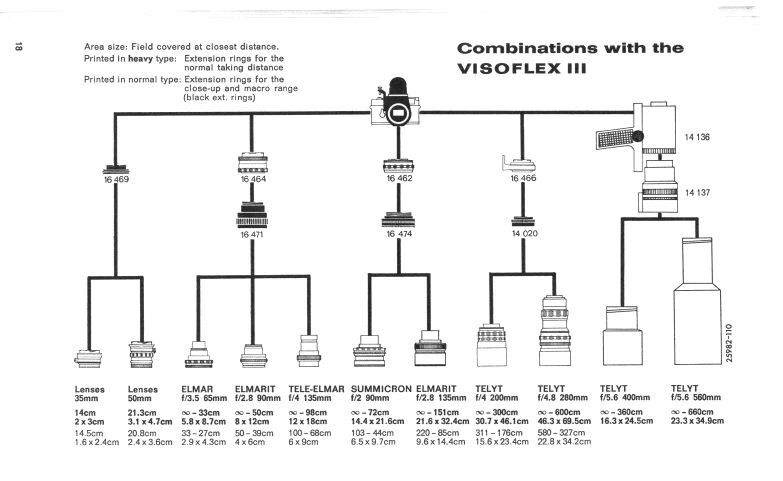 The functionality is no different, they are all interchangeable with The Visoflex II and III, but the numbers are unique. So i thought i had better warn you that the following numbers all describe the OTXBO 4x 90 degree finder. And finally, OTXBO/16499 originally for Visoflex III, but can be used for the Visoflex II and IIa. Why the different numbers? There were three separate stages of manufacturing and also some changes in development between the Visoflex II and III, consequently a change in the numbering. I've recently found out more about the 16466/OUBIO adapter from Henning Wulff (amongst many other things, i might add). All lenses designed for use on the Viso I need the OUBIO/16466 on Visoflex II and III, because it changes the mount to Leica Thread Mount, and makes the Visoflex II and III plus OUBIO/16466 combination the same depth as the Visoflex I, excluding what happens at the camera end re: M or LTM. 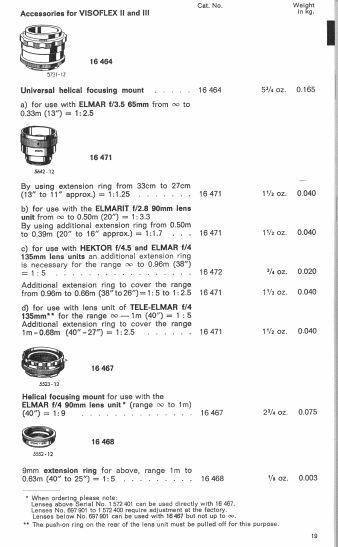 Here are a couple of images that Rob Deane sent me from a Leica catalogue which illustrates some of the possible lens/visoflex combinations (Thanks Rob!). The top image has been reduced for display, if you save it to your desktop it will be far more legible. Hopefully this will help you visualise the process involved. I have a similar chart which outlines another couple of differing options which i will scan and put up at some point in the future. There are a great many people i want to thank for suggestions, and for setting me straight about mistakes i've made. Henning Wulff for major corrections on this page in particular, but also to John Collier, Marc James Small, Ed Schwartzreich, Roy Moss, Kip Babington and Tom Abrahamsson. I'd also like to thank Christer Almqvist for the image of Che with the Viso on the opening page. Thanks Christer! Please continue over the page for more information regarding the Visoflex III.